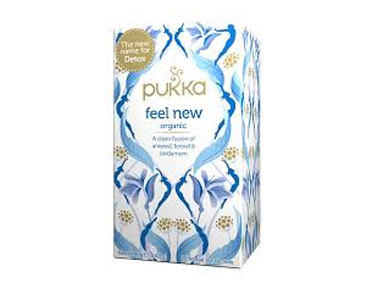 Order Pukka Feel New Tea from the Online Health Food Store UK. Buy Pukka Feel New Tea - 20 bags and other quality Pukka Teas safely online in the UK. Aniseed and lush cardamom bring your cup alive to shrug off the old and embrace the new. Prepare to reawaken with a cup of organic delight. Gentle yet purposeful – leaving your body as sweet as the fennel seed within. Aniseed and lush cardamom bring your cup alive to shrug off the old and embrace the new. Savour after meals to add a touch of transformation to your day. Aniseed (42.5%), sweet fennel seed (22.5%), cardamom pod (15%), licorice root, coriander seed, turmeric root. As official Pukka stockist in the UK, we sell quality Pukka Teas to customers throughout the UK in England, Wales, Scotland and Northern-Ireland. Pukka teas are blended to the highest standards. All ingredients (where possible) are organic. Most of Pukka teas are caffeine free. View more products on the Online Health Food Store from Pukka. Where to buy Pukka Feel New Tea safely online? Shop at the Online Health Food Store if you are wondering where you can buy Pukka Feel New Tea - 20 bags safely online in the United Kingdom. Our Health Shop is located in the UK and our award-winning independent has been serving customers in England, Wales, Scotland and Northern-Ireland since 1976. You can buy our Herbal Teas, Caffeine Free Tea, Green Tea and other quality Pukka Teas online and we post out orders to any UK address. Feel New Tea - Pukka Feel New Tea - 20 bags in Pukka Teas and Herbal Teas.